1 bedroom + den cottage, sleeps up to 4, stunning location, magnificent views! This fully renovated apartment occupies the ground floor of a traditional stone cottage in the medieval village of Eus – with the prestigious ‘plus beau ville de France’ status and claiming to be the sunniest village in France! Ideal for a couple or small family, the accommodation includes a queen-sized double room and a den off of the courtyard with day bed (opens as a single or double bed). The bathroom is a good size and has a plumbed in washing machine. A spacious, well equipped kitchen adjoins a small dining area which leads into a comfortable living room with large window looking onto the famous Canigou Mountain directly across the valley. A terraced balcony at the front and a private, shaded courtyard in the rear allow outdoor seating / bbqs, and on-street parking in front of the house is a real convenience in the steep village where most properties require an uphill walk to reach them. This is a quiet and private apartment from which to access mountain sports and recreation, historical tours, sunny beaches or just plain relaxing with a glass of the local wine and a gorgeous view! The owners are Stacy and Stewart Monteith. We are probably best described as an 'international' couple, Stacy is from the States and Stewart is from the UK. We met and married in Kuwait where, among other far-flung places, we have been teachers in international schools. We now live in Florida, again teaching for a living but now more 'grounded' and here to stay (probably!). Our Eus(ful) house was bought in 2005 to provide a 'home for the summer' when on school holidays and as a possible retirement home. Originally, it was one house that was converted into two flats by previous owners. We have kept it that way, but have completely redesigned and remodeled the interior and added windows, put on a new roof and new floors and floor beams in both apartments and had a complete rewire and new plumbing. The outside areas and the 'cave' have also been given a complete overhaul, away from the rather 'utilitarian' condition they were found in. The renovation took over 3 years but we have ended up with a property that has all the convenience and practicality of a modern home, but blends perfectly with the charming, old stone buildings of the village. We take great pride in our 'new' house and hope our guests will enjoy it as much as we do. Eus is possibly the most picturesque village in the conflent valley and irresistibly draws the eye as one drives along the road into the Pyrenees. When we were seeking a property to use a s a holiday / retirement home in the area, we never thought it would be possible to find an available home for sale. We consider ourselves extremely fortunate that something did become available and what's more, a house which we fell in love with at first sight. We are now very happy that we can share the good fortune to be able to holiday in such extraordinarily beautiful surroundings, with our guests who have always expressed a similar appreciation for their stay in our 'home from home' in Eus. Towels supplied. One set for each guest, including bath towel and hand towel. Automatic washing machine. Wall mounted blower-heater. Extractor fan. Seats up to 4. DVD player and music center. Electric oven + 4 burner electric hob. Over-hob extractor with lights. Microwave, Toaster. Electric kettle. Full set of cookware, crockery and cutlery. Seat up to 4 in indoor dining area. Outside courtyard table and chairs and bbq for outdoor dining. Along front of house. 2 chairs and side table. Sun shade. Privacy fencing. Fabulous views. From Kitchen - Private and shaded. Garden table and chairs, sun shade. Retractable clothes line. 1 hour drive, or 1 euro 'ski-bus' to the slopes (from Prades). Fully equipped kitchen, all modern appliances. Kitchen, at rear of property, opens onto shaded, private courtyard with wood/charcoal BBQ. Front of house balcony with side table, seating and privacy fencing. Great for sunset views of the valley and the Canigou. Smoking restricted to outdoor areas. Traditional window shutters and double glazing throughout - warm in winter, cool in summer. All rooms with independently controlled heaters. Automatic clothes washer in bathroom. Street parking in front of property. Broadband wireless internet (for wifi enabled devices). The apartment above is also available for rent, comprising a large, double bedded room to sleep 2. See property 1406086 for details. A discount is available if both apartments are booked. 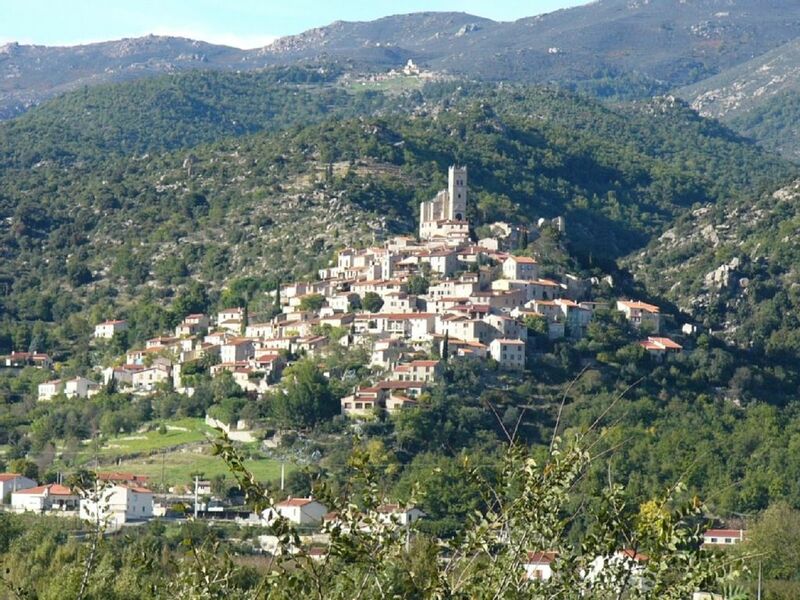 The pretty village of Eus sits on a small hill aside of the Têt Valley, looking out across fields of peach orchards and commanding a magnificent view of the Canigou Mountain. In the valley below lies the market town of Prades, sleepy for most of the year but coming to life in August with the music of the Pablo Casals Festival. In the surrounding area, opportunities for an active vacation or a relaxing escape are plentiful; access the castle-strewn history of the region (Villefranche/Castelnou), the art-culture of Ceret and Figueres (Picasso/Dali) and the beaches and picturesque fishing villages of the Mediterranean coast (Argeles/Collioure). Alternatively, pursue adventure in the rugged Pyrenees mountains, or indulge in therapeutic relaxation and resuscitation at the many sites of natural thermal springs (Molitg/Vernet les Bains). In the Winter months, take your skis up to the high slopes (Les Angles/Font Romeu), less than an hour away. Be inspired, it's all here!